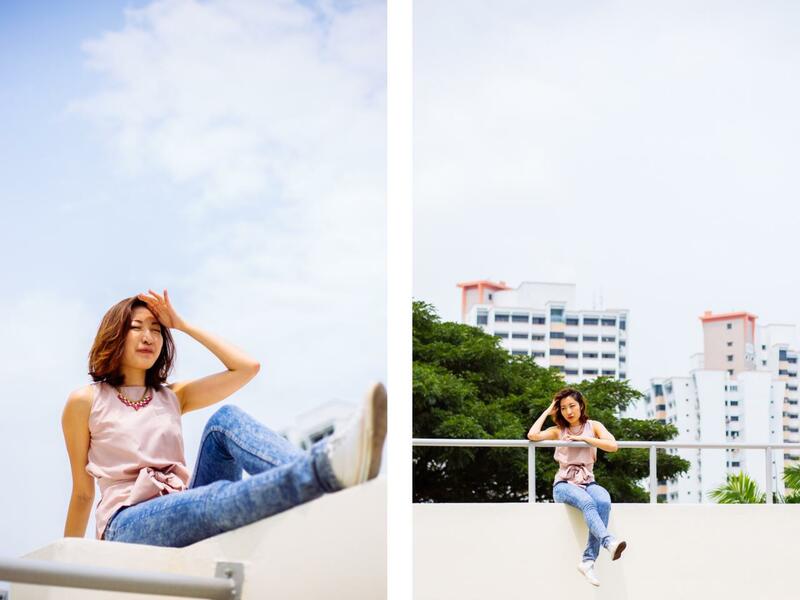 I finally had time to do a "ghetto" carpark rooftop shoot with dearest Phoebe. I paired this otherwise very girly and feminine ribbon bow tiefront top from Shop at Velvet with acid-wash Cheap Monday jeans and my trusty ol' Converse sneakers. I don't usually go with streetwear, but this shoot was very fun and liberating to shoot. I was running across the rooftop, jumping from one elevated platform to another, jumping off heights, and laying around on the concrete. Sometimes it's always nice to venture out of one's usual style and be someone else. I usually reserve that to once or twice a month, usually dressing up for themed events - hip hop, ghetto kid, punk rock... I've tried them all. And then coming back to my own personal style, wearing clothes that fit well and make me feel good always feels like coming home. Almost like the fabric is embracing you. I guess that's what they call second skin. "Ok, now jump!" "Omg really cannot it's too high and scary!" "Just jump lah." "Okok I'm jumping! AHHHHHH"